An online version, which will provide most of titanbrowse’s functionality, without the need to download or install any data, is under development and testing. To use the online version, click here. A video tutorial of titanbrowse’s use is coming soon. Since Cassini’s arrival at Saturn, VIMS has recorded tens of thousands of cubes, containing tens of millions of spectra. This still increasing amount of observations precludes direct inspection of all data, either to select the observations, or to identify the occurrence and time variation of specific spectral or spatial features. Additionally, many VIMS observations are taken as a large number of cubes with small spatial extent, which cannot be meaningfully visualized without assembling mosaics. To deal with these difficulties, we developed titanbrowse. It comprises both a database of observations, and a visualization tool to inspect them. The database contains every VIMS observation of Titan in the PDS archive, and provides a flexible query system, which can select individual cubes or spatial pixels based on arbitrary functions of the instrumental or photometric data. Once observations are selected, titanbrowse can be used to directly inspect them, through mosaics in several map projections, or displaying images of selected bands, or spectra of selected spatial pixels. This allows users to interactively explore the data, to refine queries to obtain those most useful to the intended analysis. 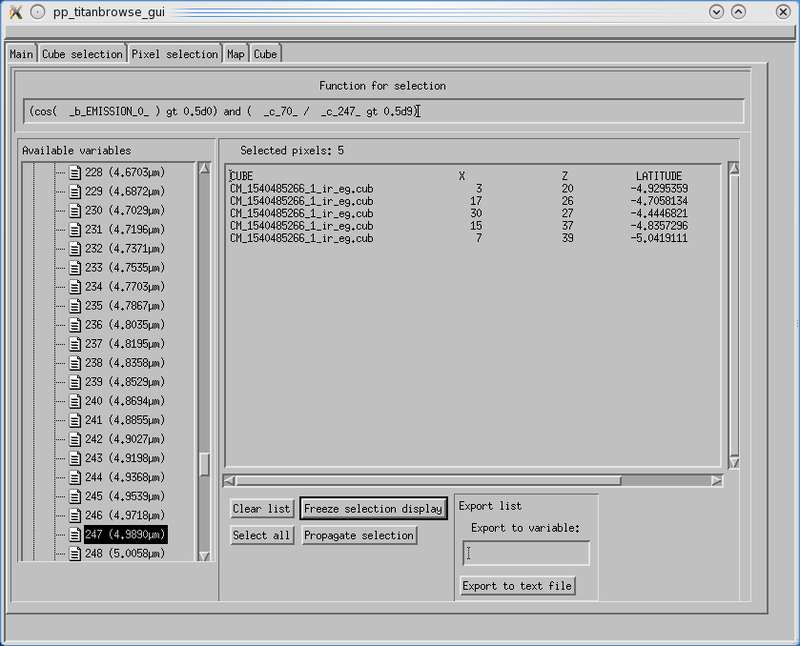 The selected cubes or spectra can them be directly exported from the database, either to an IDL session, or to files (one possible format being the original cubes, in ISIS cube format). The cubes used in the database were processed to contain more geometric information than either the original PDS files or those that are produced by the VIMS pipeline, including the coordinates of the edges of each spatial pixel (necessary for precise mosaics), and more information on the illumination angles (to aid in analyses of specular reflections). This version is a complete reimplementation of it’s the previous, titan_browse, to overcome the previous coverage and performance limitations, and is the first to be made publicly available. An online version is under development. 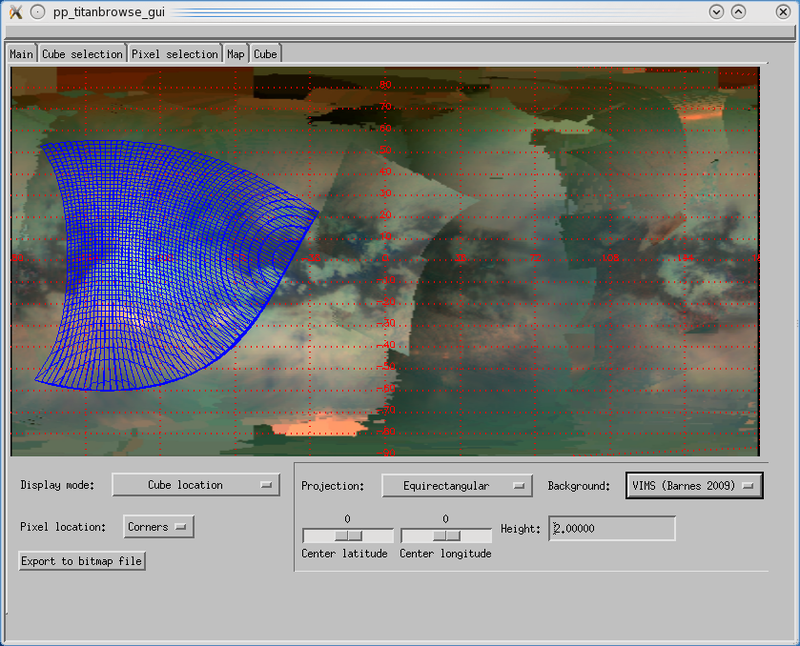 The geometric data is calculated for the center and each corner of every pixel, necessary to determine the projection of every pixel on Titan. This is of particular relevance for cubes taken at low spatial resolution, cubes with a small length in one dimension (even 1 pixel wide cubes), and cubes with large pointing changes between pixels. The geometric data is calculated even for pixels that do not intercept the surface, in which case they refer to the point in the line of sight nearest to the surface. 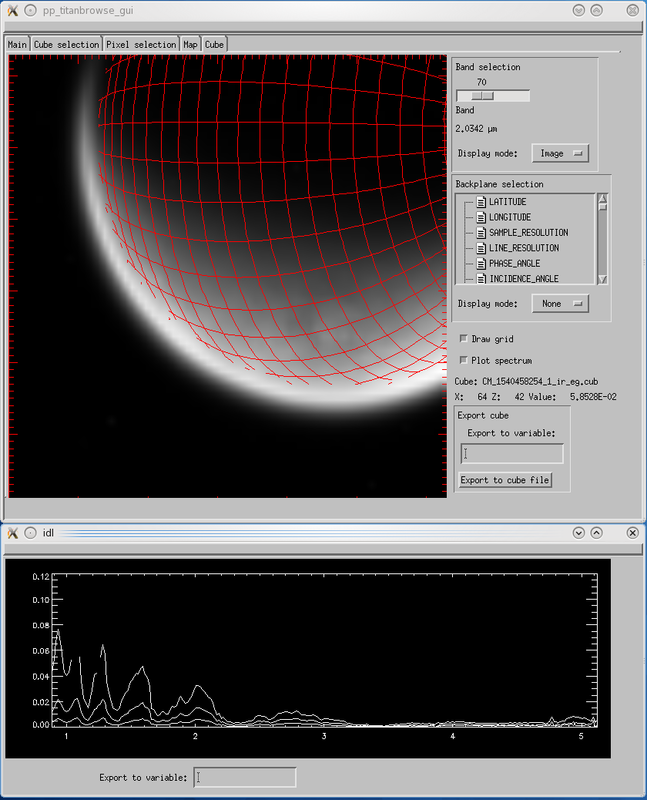 This is essential for studies of Titan’s atmosphere, with spectra taken over Titan’s limb, which are unique as they provide direct vertical resolution of the atmosphere. More illumination data is calculated, including the location of the specular reflection point, and its distance from each pixel. This data is of particular relevance for detection of liquid surfaces, and studies of the surface’s scattering function. These data are calculated for each pixel, to account for cubes where a large geometry change occurs between the time each pixel was recorded. The geometric data are incorporated into the cubes into their header (for data which are constant over the cube), and into backplanes (for data which vary for each pixel). The current implementation produces these 52 backplanes. The data structures and the usual criteria for its access and selection are very array-oriented, and IDL provides ample support for efficient array processing. 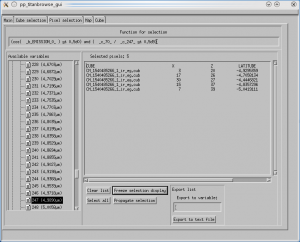 Dynamic interpretation of complex functions to be used for data selection and visualization, making use of IDL’s standard library and user-defined functions that may be the same used in the data analysis. Integration of the database use with an environment commonly used for the subsequent data analysis. For instance, selected metadata, spectra and entire cubes retrieved from the database can be immediately used for analysis, with no need for separate data export/import through files. Integration between database access and visualization of the results, making use of the variety of visualization tools provided by IDL, including map projection functionality. Ease of development and maintenance. Internally, the database objects contain all the processed cubes, stored as a collection of objects of a class called pp_editablecube. This class provides a convenient way to read, edit, write and store ISIS cubes, allowing access (and modifications) to the entire contents of a cube (header, core bands, backplanes, sideplanes and bottomplanes) through an interface more complete and easier to use than any other routines that could be found. Cubes can be kept stored directly by these objects, and ISIS (.cub) files can be recreated with a simple call to one of their methods. No external libraries (such as ISIS) are needed to use the database or the cube objects. For each PDS dataset, the database keeps its data in two files: one contains cube metadata, and all cubes as pp_editablecubes, thus in a “cube-major” order. 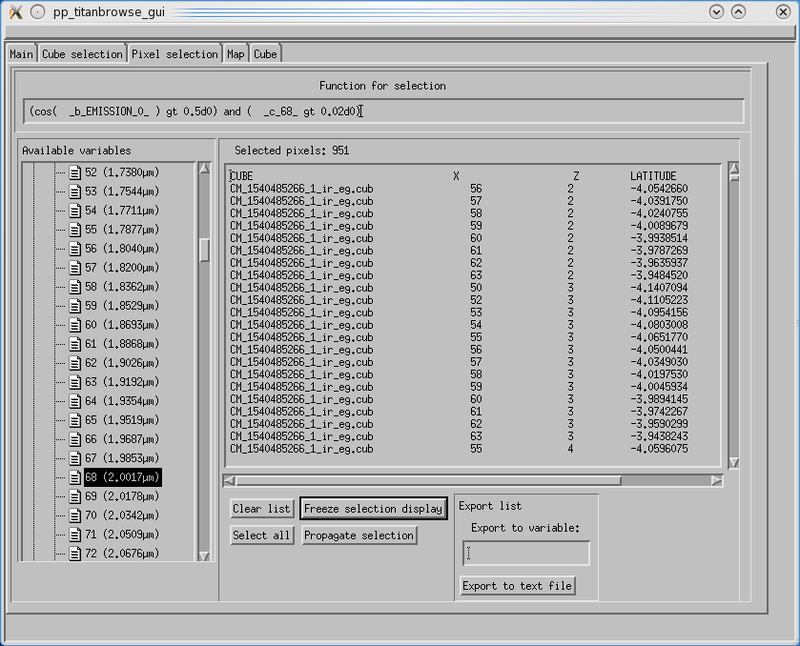 For more efficient access during pixel selections, the second file used by the database contains the cube core and backplanes in a “band-major” order, so that only the needed bands get read from disk. This allows the database to handle every VIMS titan cube recorded, and conveniently provide query and access to them, without the need to have the original cube files. 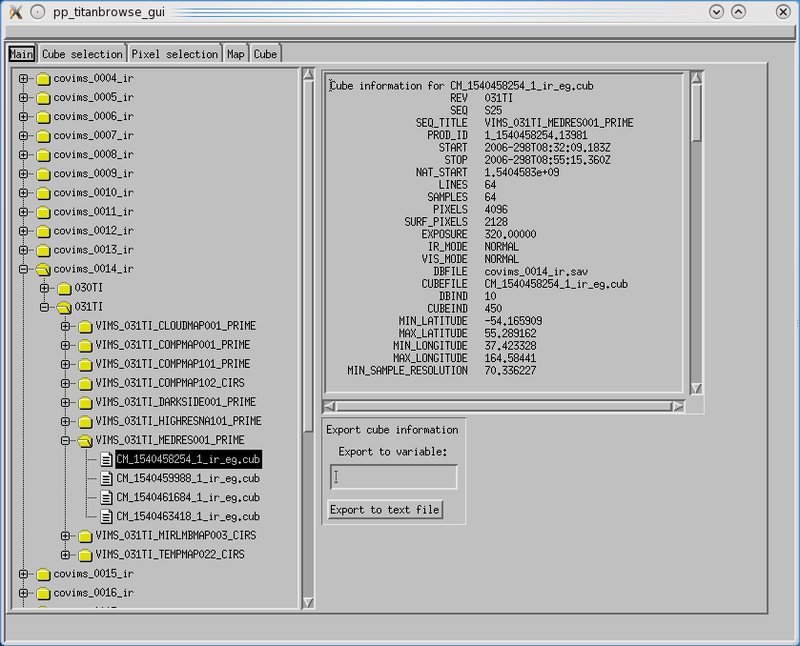 Though the entire database was implement to be accessed programmatically, to aid in selection and visualization, titanbrowse includes a graphical interface. 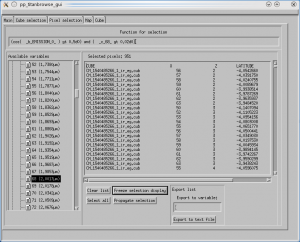 In addition to the functionality provided by the API, this GUI provides visualization of individual cubes and spectra, and geographical mapping of the selected pixels, to aid in interactive exploration of the data. 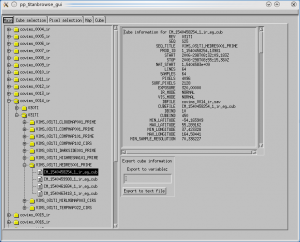 As from the API, the selected data and metadata can be directly exported to variables to be used in the IDL session, or to cube and text files. The cube selection panel, where the user builds arbitrary functions to perform queries over cubes. The pixel selection panel, where the user builds arbitrary functions to perform queries over pixels or to be evaluated and displayed on the map. The visualization panel, where the user can see individual bands or individual spectra from specific cubes. The cube browser panel, where the user can see metadata for all available cubes.